There’s never been a more important time to take charge of your oral health than now. 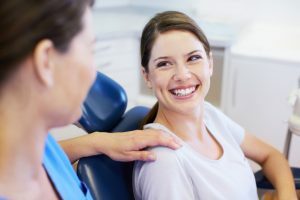 Because periodontal disease has been linked with many other health concerns such as cardiovascular disease and high blood pressure, regular dental hygiene visits have become more important than ever. Dentists and physicians alike understand that by maintaining your oral health, you’re also ensuring your overall health and well being. Dr. Stephanie Santos and Dr. Vinita Folck are your premiere dentists in Virginia Beach and they discuss the importance of regular hygiene visits. Periodontal (gum) disease occurs when plaque and tartar build up below the gum line and separate your gum tissue from your tooth. When this happens bacteria is allowed in. Did you know that this bacteria can also enter your bloodstream and travel to other areas of the body? It can also destroy your bone and lead to tooth loss, if left untreated. At Smile by Design, we screen for gum disease at every cleaning and check up appointment because we understand that prevention is the key to optimum oral health. Gingivitis is the early stage of gum disease where you may notice that your gums are red, swollen, and bleed when you brush your teeth. If we can detect gum disease in this stage, we can help you effectively control it with a thorough professional cleaning and improvements to your home care routine. Another dental condition best detected early on is tooth decay. Sugar fuels the bacteria in our mouths, which produce the acids that can destroy our tooth enamel and cause cavities, or holes in your teeth. The decay has to be cleaned out by your dentist, and the hole filled in order to preserve the strength and longevity of your tooth. We also screen for tooth decay at your regular dental appointments because believe it or not, your dentist can actually detect tooth decay earlier than you can. We can see it through our examination and on x-rays in its earliest stages. Early detection ensures that you receive the most comfortable and least invasive treatment. At Smile by Design, we recommend that you visit us every six months, or twice per year so we can help you remove excessive plaque build up, screen for oral conditions, and monitor your oral health. We encourage you to contact us today to schedule your next appointment. Your health is too important to ignore!